Strike King's Tour Grade Skipping Jig is the ultimate jig for skipping under docks. This jig features a corkscrew keeper which will help keep your trailer on while banging around and a durable powder coated paint. 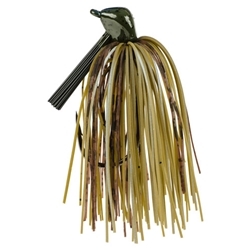 The Skipping Jig has a unique shaped head that helps it to skip across the water way up under boat docks.